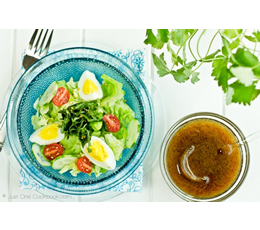 Wafu dressing is an authentic Japanese style salad dressing. We love reading Nami’s recipe descriptions at JustOneCookbook.com! Grate onion until you get ¼ cup of grated onion and juice. Combine everything in a bowl and whisk all together. Keep it in the fridge until it’s ready to use. Whisk well before you pour onto the salad. In this salad Nami suggests putting butter lettuce, hard boiled eggs, cherry tomatoes, wakame (seaweed), and shiso leaves.